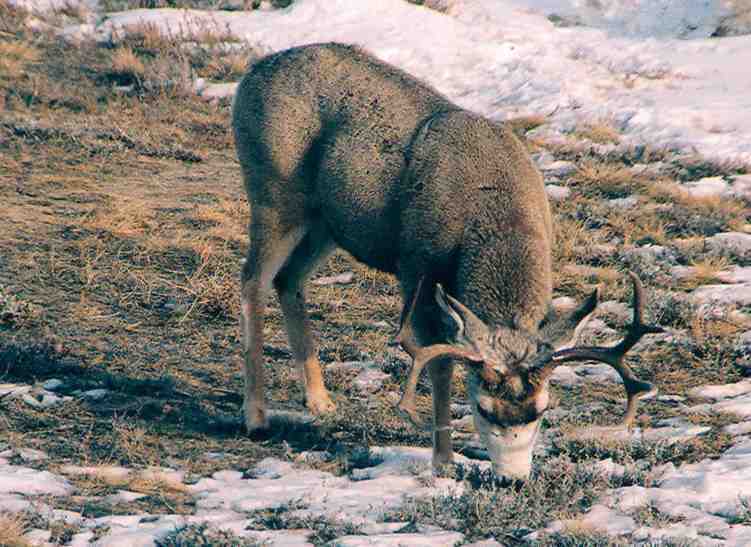 Mule deer are the dominant species of deer in Wyoming. They live across most of Wyoming, on the open plains, the lower mountain areas and even in towns. Mule deer can weigh 100 to150 pounds. They are larger than pronghorn antelope and smaller than elk. Mule deer have one or two fawns in late May or early June. 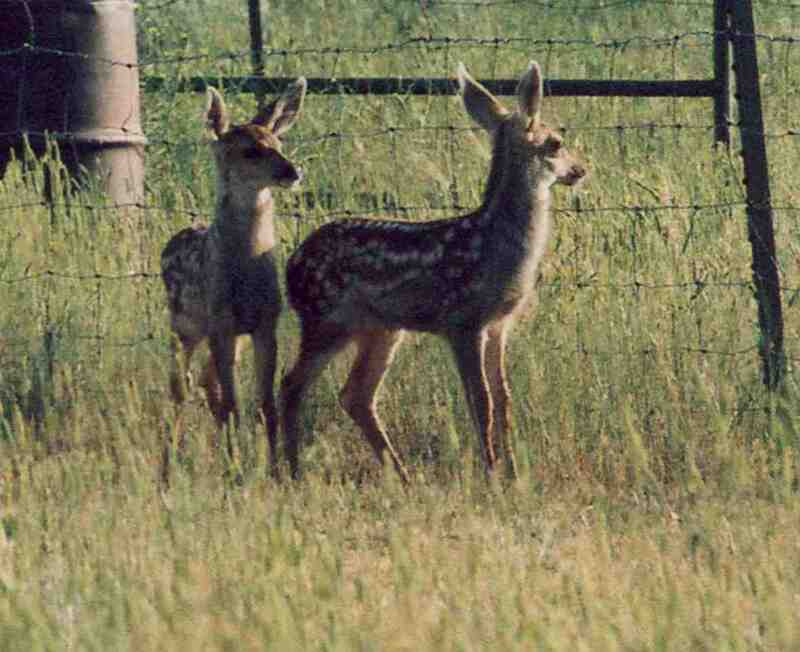 The fawns stick with their mother throughout the summer and often through the winter. I have seen a doe in the spring have twin fawns and a yearling tagging along. Bucks tend to group together during the summer until rut begins in the fall or early winter. Then the competition for does begins and the bucks become rivals. The larger bucks will chase off the smaller ones, then spar with each other. Occasionally, bucks will get antlers tangled and sometimes die as a result, though this is not common. 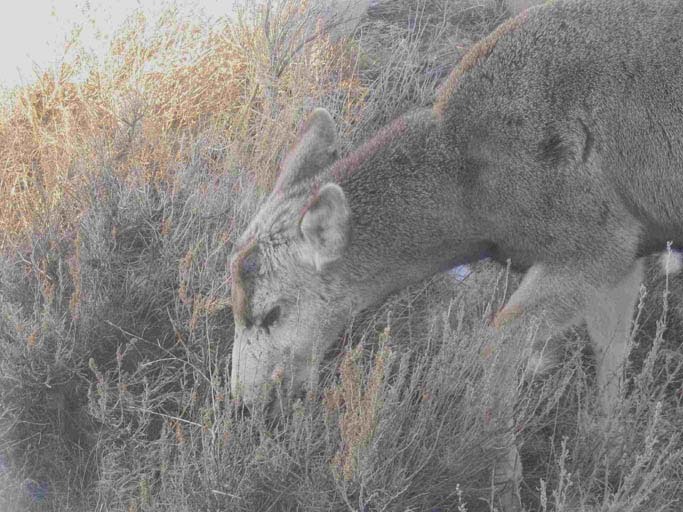 Mule deer are browsers--meaning they feed on plants, not grasses. This is good news for ranchers who have grass hay and homeowners with nice grass-only lawns. For anyone trying to put in a windbreak or landscaping in a yard, this is bad news. Deer are also excellent jumpers, which means fencing them out requires a very tall fence. From personal experience, I can say for certain deer can jump an eight foot fence without a running start. My garden fence had an eight foot fence until two years ago when the deer learned to jump it and started doing so on a regular basis. I increased the height to nine feet and they have not yet jumped it. One problem with deer that I had not anticipated was startling deer in my garden and having them panic and crash into fences. This happened two winters ago and I lost sections of the fence on two sides. Fortunately, the deer were not injured. This is not always the case, especially in town where where the deer may be trapped in a small yard. This is important to consider if you are in deer territory. After years of watching Walt Disney and other realistic portrayals of deer, people tend to believe deer are all warm and fuzzy. This is NOT the case. While people are often seen feeding petting deer, this is not advised. 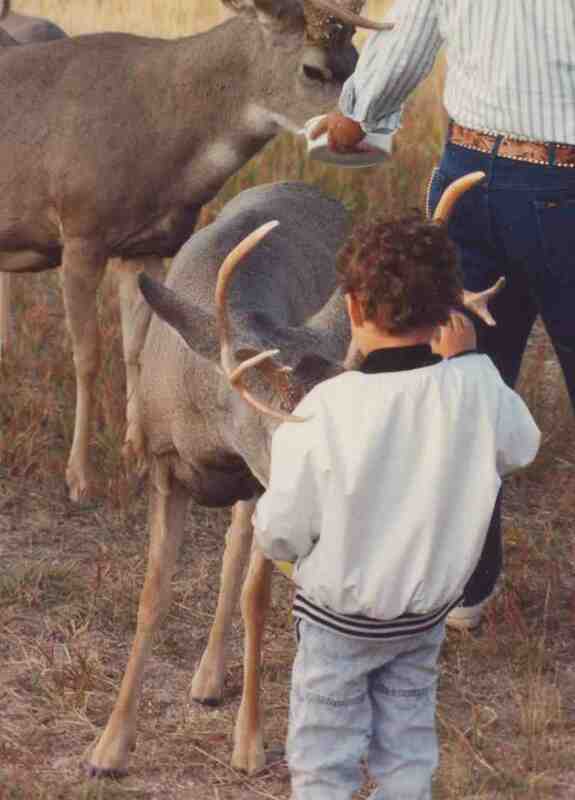 I am including a picture of a child with his head INSIDE the antlers of a very large buck--he is petting the deer. This is extremely dangerous--the antlers are sharp and deer are very strong. The child could be seriously injured by the antlers or the deer could kick the child. There are frequent reports of individuals being injured and even killed by deer. Remember, deer in "real life" are wild animals. Another common result of deer coming in close to town or migrating from one feeding range to another is automobile/deer collisions. Sometimes fencing will help, as will "Deer Crossing" signs. As populations of deer increase near roads and towns, the collisions become more common. If subdivisions are added to an area, there is also an increase in collisions. All of this costs us money and can be fatal to the drivers involved (it is usually fatal to the deer). Swerving to avoid deer also can kill drivers and destroy cars. These issues need to be address if people want to live in an area where deer are. Not thinking about or considering these problems just results in expensive hospital stays and auto repairs and dead deer. 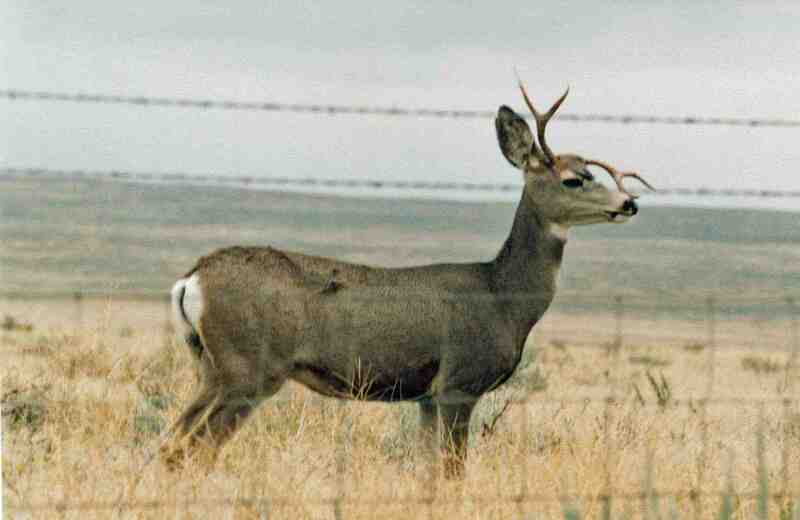 There is considerable controversy concerning the effects of natural gas drilling on mule deer. Some believe the drilling is harmful to the deer population--and there is evidence that deer do move away from an active drill site. However, as pump jacks replace drill rigs and activity decreases, the deer often return to the area. The deer in my yard were originally living on an established oil field to the east of my house. Of course, there is more to feed on in our development than in an oil field and more shelter in our windbreak. there is also ample water due to horse tanks, etc, so the deer now live in the subdivision. Mule deer are very interesting and very adaptable animals. While habitat reduction will undoubtedly have some impact on the mule deer, the deer can adapt and will continue to do so. Yes, they will move to the less populated areas for a while, but they can live among humans, until the humans get tired of them. This often occurs when very expensive landscaping is destroyed, pets killed, etc. We have to decide how closely we want the deer living to us before we take away all the habitat that keeps them at a distance. Feeding and petting invite deer into our lawns and parks. If we do not want our lawn and parks damage by deer, we need to change our attitudes and practices concerning deer.